And here it is, can I have a fanfare please, tatata taaaa! the first carnival on raising multilingual children. When I stumbled across my first hurdles in raising my daughter bilingually, all the books I'd bought were of little use. So, in good old blogger fashion, I tried to find blogs on the topic to get some answers to the questions that I had. It wasn't as easy to find blogs about raising bilingual children, and there is no significant online community that brings them together. Up came the idea of a bilingualism carnival in the hope that this may kickstart some discussion on the topic, some exchange of experiences and ideas, and provide a platform for parents to find answers, share tips and signpost to resources. The plan is that there will be a regular carnival on the topic which will support parents going through the trials and tribulations of keeping more than one language and culture alive in their households, while providing a resource of ideas and experiences for those who are or plan to bring up their children with more than one language. The great thing about bilingual parenting is that often, the language combination doesn't matter so much because the experiences are quite similar whatever the language pair. To be fair, the blogs I've come across have given me more ideas and support than any of the books on bilingualism I bought (and believe me, I bought quite a few). If you're interested in hosting one of the next carnivals, please go to the bilingual carnival page over at Bilingual for Fun, where you can find the schedule and register your interest. The next carnival on raising children bilingually will be over at Blogging on Bilingualism, on 30th September 2009. Please send your contributions to whim2 @ comcast.net leaving out the spaces in the address. Above all, huge thanks, danke, gracias, spaciva, grazie, merci, go raibh maith agat, dank u well to everyone who contributed to this first raising bilingual children carnival! Bilingual children: how to start seems to be just the right place to begin this carnival. Barbara at Barbaraland raises her children with Italian and English and dispels the myth that raising bilingual children will confuse them or may be bad for their language development. Not so very sure about this is Verbosity leads to unclear, inarticulate things in her hilarious post On swinging both ways, however, I always thought the 400m hurdles were the most exciting part of any athletic championship, so here's to bilingual hurdlers! Fraught Mummy at Brits in Bosnia ponders in her post Learning Languages the way her family's move to Bosnia has affected their children's ability to speak English and how they may lay the foundations for future trouble, with their children being able to speak a language they themselves aren't fluent in. If your children are approaching school age, Letizia at Bilingual for Fun offers a comprehensive guide on chosing the right schooling for your bilingual child. Jan at Babelkid (what an aptly named blog - in his household the children speak French, Arabic and German) has his kids telling him off for using an English word at the breakfast table in a very clever turn of usual events, when he is told that English is not spoken here. Similarly, Ju at Double Trouble is told off by her daughter for speaking Portuguese at the school in her post Ingles/Portugues (apologies for lack of Portuguese characters, I haven't figured out how to use special language characters in blogger). Kathryn at Life in Italy writes about her experience of raising two children bilingually in Italy, with English as the "other" language having found out that text book approaches are just that but real life is a different story altogether. Along similar lines, the Perfectly Happy Mum Peggy will make you laugh out loud in How the hell am I going to teach these kids French where she tells us about her attempts to establish the one parent one language approach in her house. Life's never that straight forward and there are always a number of reasons not to be consistent, I say nodding my head in "been there, know what you mean" agreement at every paragraph. Emily at Maternal Tales From the South Coast too struggles as she explains in her experience of raising her children French/English in England. It's not as easy as she thought, but not all hope is lost as she will tell you in her post Bilingual Children erm not quite. And to add to that, I'm including my own first post on the topic of bilingualism, one child, two languages where I explain why raising Cubling bilingual is so important to me and why at the same time in spite of my determination, well, it could be going better. You can find out all about a bilingual kindergarten on Blogging on Bilingualism where Eve interviews a local German woman who runs a bilingual kindergarten. A fascinating idea, and one that would really help us struggling parents keep up the weaker language (I for my part would be welcoming a German childminder with open arms). Finally, Smashed Pea at Intrepidly Bilingual looks back on her experience of raising her children bilingually with hindsight in If only I had known..., a great resource for anyone starting out on the bilingual kiddo route or parents at a head scratching phase who are looking for some encouragement and ideas on how to keep going. 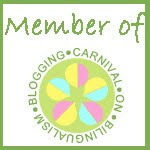 That's it for now, hope to see you all at the next carnival on Blogging on Bilingualism! Thanks for getting this all together. I shall be reading with interest! My two are a long way from bilingual, but they are getting there slowly. We shall see how it goes, but in the meantime, I'm very keen to read about how others are tackling the problems of learning 2 languages at once. This sounds like a great idea and I will be watching with huge interest and reading all the blogs listed when I get some spare time, currently raising our son (3) with English at home and Catalan at nursery soon to be school, whilst struggling myself to learn Spanish. I definitely feel that my Son's English has been held back by only hearing it from my & OH. At home I speak only in Portuguese while hubby speaks in English to the kids. They are fluent now but I think we're quite lucky. My older one prefers talking in English and things will get more difficult now that she will starts school. thank you very much for this. You had a great idea! I'll be happy to host after Blogging On Bilingualism, i.e. around October 30th. As discussed I think it would be best to have a static page for the schedule and exchanging other infos, here it is: www.bilingualforfun.com/about/blogging-carnival-on-bilingualism/. Let's use it coordinate. If you want to host let me know and I will update the schedule. Loks fantastic! Can't wait to read all of the posts. Well done putting it together. This really is a great idea. Thank you very much. Looking forward to the next one already. Thank you for doing this. I'm very interested to read all the posts. I want to apologise for not doing one myself. I started about ten times, and just could not get anything interesting down. Maybe next time? thanks everyone, hope you all enjoy the posts as much as I did! I definitely spilled some tea for bursting out laughing, and lots of oh's and ah's too. Mwa, would be lovely if you joined in next time. Glad I stumbled upon this carnival. Thanks for all the information and pointing to other blogs/moms who have experience with raising bilingual kids. We are just at the beginning of our journey, with our 19-month old son. But I can already relate to some of the experiences and concerns discussed. Very useful. I look forward to future carnivals, and maybe I can contribute once my son really starts talking? Every time I go abroad I spend my last £20 equivalent of foreign currency on a children's book or two in the language of that country - some excellent colourful children's books in Spanish, French etc that it doesn't take a lot of imagination from adults to understand (and you can always look up strange words online anyway). If interested, please add any stories or translations of key expressions for children to my group Multilingual Families. I'll get writing for the Carnival now! Thank You for being the member of this website. Please allow me to have the possibility to show my satisfaction with Host Gator web hosting. They have professional and express support and they also offer many [url=http://tinyurl.com/hostgator-coupons-here ]Hostgator coupon codes[/url]. I'm right here to assist get your internet site off to an incredible start. Do not be 1 of these that wished they had accomplished it better the first time, then get around the task, and expense, of starting above. Your internet site reflects that which you as well as your company or hobby are all about. I am able to offer low-cost, user-friendly, customized created internet sites to get a broad assortment of companies, organizations and teams.Additionally, it shouldn't cost a fortune to obtain you started. I will assist manual you through the procedure and even warn you when i think you may be finding in above your head, or beyond your spending budget. Hi, I, too, raise two bilingual children and shall be following your blog with interest. Oh looky, a mossy jacket!